This is one of my new favorite recipes for kale which we have been eating a lot of lately both for it’s rich earthy flavor as well as it’s nutrients. If my kale is large, I usually blanch it first in boiling water to soften it, but if you are lucky enough to find, smaller more tender bunches of kale you can skip this step. We like our food with a bit of heat, but if you don’t, you can eliminate the red chili pepper altogether, or simply use less. I was lucky enough to find a package of pancetta at Whole Foods, but if not available in your area bacon can be substituted in it’s place. Kale is a delicious, healthy vegetable packed with nutrients and you can read more about it here. This dish is a great side dish for just about any type of grilled or roasted meat. Along with it’s other members of the Brassica family, this low calorie green provides an excellent source of vitamins A, C, Carotenoids, along with a decent amount of fiber, iron, and calcium. The amount of vitamin K, important for blood clotting, in kale is far superior to that found in broccoli, spinach, and Swiss chard. 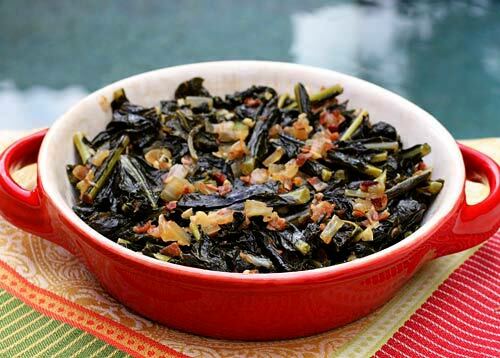 A full flavored greens side dish flavored with onions and pancetta. Trim and wash your kale and drop into a large pot of boiling water for about 5 minutes, then drain, and squeeze it to remove as much water as possible. In a large saucepan, heat the olive oil and cook the onions and pancetta together over medium heat until the onions are soft and the pancetta is beginning to brown, about 5 minutes. Add the garlic and chili (if using), and cook for another minute or two. Add the kale and toss with the other ingredients, adding about 1/2 chicken broth to start. Reduce the heat to low, and simmer until the kale is very tender, adding additional broth as needed to prevent the mixture from drying out. Season with salt and pepper and increase the heat for a couple of minutes until the broth has evaporated.